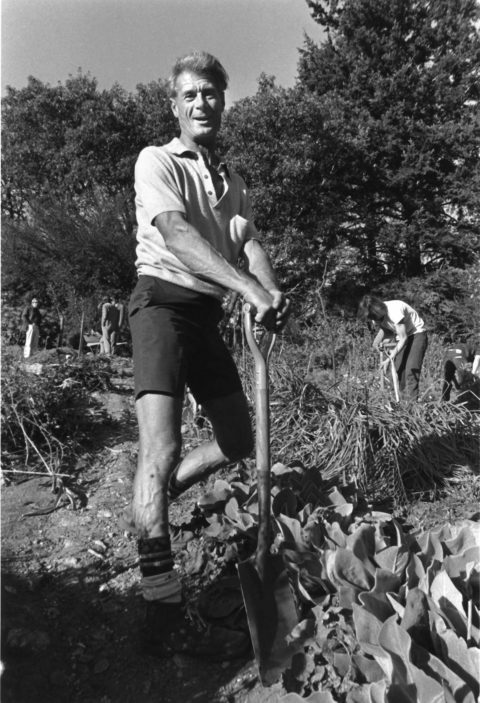 Master gardener Alan Chadwick's legacy lives on: The campus is celebrating 50 years of leadership in organic farming and gardening with a year-long series of events, including a Farm dinner in July with Chez Panisse founder Alice Waters. This year marks the 50th anniversary of that garden, and a series of events will celebrate the valued and enduring contributions the campus has made, now under the auspices of the internationally recognized Center for Agroecology and Sustainable Food Systems. The festivities include the arrival in April of 39 apprentice farmers and gardeners, heirs to the legacy of those who created the first garden in 1967; a three-day "First Fifty" celebration in July; and the annual Fall Harvest Festival in October; details below. "We've led the movement toward a healthy, socially just food system for 50 years," said Daniel Press, the Center's executive director and UC Santa Cruz professor of environmental studies. "Our vision of a sustainable food system encompasses environmentally sound farming, as well as safe working conditions and livable wages for the people who work in it." Over the decades, the grassroots effort begun in 1967 by legendary English master gardener Alan Chadwick and a cohort of students has evolved into a hub of teaching, hands-on learning, pioneering research, and advocacy for people who grow, process, and distribute food. The Center's path-breaking research on organic pest and disease controls offers strawberry growers alternatives to methyl bromide and other soil fumigants. Hundreds of UCSC undergraduates learn the fundamentals of organic farming and gardening through "hands-on" classes and internships at the UCSC Farm & Garden; students can choose a concentration in agroecology and sustainable food systems offered by the Environmental Studies Department. This year's apprentices include educators, urban farmers and gardeners, youth empowerment advocates, three graduate students, and several recent college graduates; the Class of 2017 begins April 10 with participants from across California, as well as Oregon, Washington, Arizona, North Carolina, and South Africa. The Center spearheaded UC’s systemwide adoption of 20 percent "real food" purchases, driving the university's commitment to buy food that is produced in a fair, humane, and environmentally sustainable manner; UC Santa Cruz is committed to 40 percent "real food" purchases for its dining halls and other food facilities by 2020. The Center is improving K–12 school nutrition programs in 15 school districts in Monterey, San Benito, and Santa Cruz counties. • July 28-30: "First 50" Celebration includes a Friday reception, a Saturday symposium followed by a dinner and dance, workshops, field trips, and more.